Casey Kozlowski is currently serving in his second term of office as a member of the Ashtabula County Board of Commissioners. Casey was initially elected in November of 2014 and was subsequently re-elected in November of 2018. Casey Kozlowski is a lifetime resident of Ashtabula County and has dedicated his entire adult life to serving the public in various facets throughout the community. 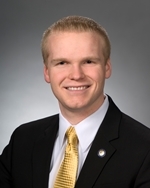 Most recently, Casey served as State Representative representing the 99th Ohio House District, which included Ashtabula and northern Trumbull counties. During his legislative tenure, Casey introduced seven pieces of legislation, of which four were signed into law by the Governor, ranging from legislation that embraced fiscal responsibility to legislation that helped enable small businesses to expand their operations throughout Ohio. Casey has served as Vice-Chair of the Transportation, Public Safety & Homeland Security Committee, in addition to serving on the Agriculture & Natural Resources Committee, Education committee and the Small Business & Economic Development committee. Casey has served as a member of the Pymatuning Valley Board of Education, after being elected as one of the youngest members of a public board of education in Ohio. During his tenure on the board, Casey served as a member of the bargaining team, as board President, Student Achievement Liaison and as a member of the Ohio School Board Association. During his time as a member of the OSBA, he served a leading role as a member of the Small School Districts Advisory Council and was a Delegate to the OSBA Delegate Assembly. In addition to his public sector involvement, Casey has been employed as a Business Manager for a local company. In his role as business manager, he held the fiduciary duty of securing financing for clients, holding responsibility for profit and loss of the organization and was involved in the day-to-day marketing operations of a multi-million dollar operation. In addition to his elected and private sector experience, Casey has served or is a member of several organizations, including: Ashtabula Rotary Club, Ashtabula Lions Club, First Baptist Church of Jefferson, Ohio Farm Bureau, Ducks Unlimited, among several other local charitable and service organizations and numerous local area chambers of commerce. During his tenure on the Board of Commissioners, Casey has served as: Board President, the C.E.O. of the Northeast Ohio Consortium Council of Governments, Chairman of the Eastgate Regional Council of Governments, as a member of the Board of Directors for the County Commissioners Association of Ohio and as liaison for numerous boards and committees including: the Convention Facilities Authority, 911 board, Community Corrections Planning Board and as a member of the Substance Abuse Leadership Team. Casey is a 2018 graduate of the NACO County Leadership Institute, 2016 graduate of the LEADERship Ashtabula County program, is a 2012 recipient of the “Top 5 under 45” award by the Young Professionals of Ashtabula County and received the “Connect” Award of Excellence from the Greater Ashtabula Chamber of Commerce. Casey holds an Associate of Arts degree from Lakeland Community College and a Bachelor of Science degree in Applied Management from Ohio University.